1To what extent are American schools segregated? 2What is the history of school segregation? 3Has school segregation gotten worse recently? 4What impact does integration have on students? 5Why does integration seem to improve student outcomes? 6How common are integration efforts currently? 7Have school choice programs, such as charter schools, helped integration efforts? 8 Is racial segregation the result of public policy (de jure) or choices by individual families (de facto)? 9Do parents and families want their children to attend integrated schools? 10Is most school segregation within districts or between districts? 11What are some arguments against pursuing school integration? 12Has the federal government pursued integration in recent years? 1/12 To what extent are American schools segregated? Significantly, whether measured by race or socioeconomic status. For instance, a 2016 report by the Government Accountability Office found that about one-third of schools were composed primarily of either low-income black and/or Hispanic students or affluent, white students. 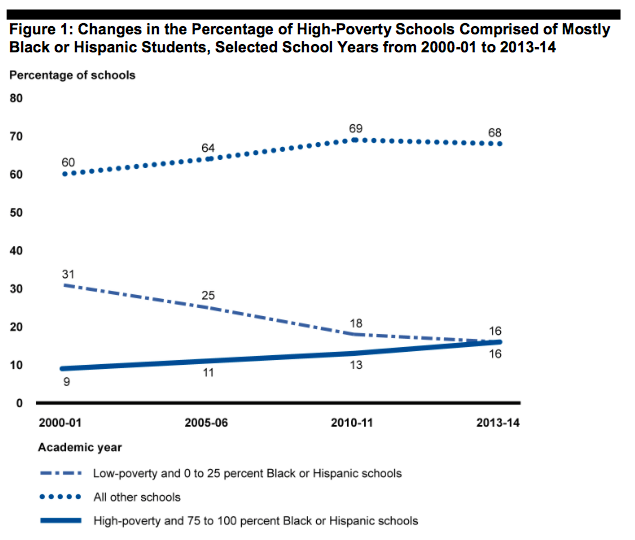 Another study, from the UCLA Civil Rights Project, found that the average black or Hispanic student attends a school where about two-thirds of classmates are low-income. 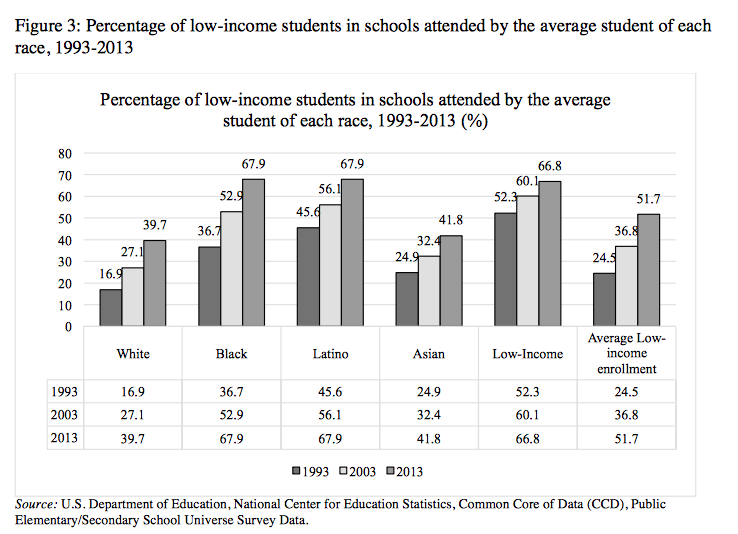 In contrast, the average white student attends a school where about 40 percent of students are low-income. 2/12 What is the history of school segregation? Brown: In 1954, Brown v. Board of Education overturned Plessy, ruling that having separate schools for black and white students violates the 14th Amendment. “We conclude that, in the field of public education, the doctrine of ‘separate but equal’ has no place. Separate educational facilities are inherently unequal,” the court famously declared in its unanimous decision. Resistance to integration: The push for integration — prompted in part by Brown and other court decisions — sparked massive resistance. Cities in Virginia closed schools altogether to avoid integrating. The National Guard was sent in to the University of Alabama as segregationist Gov. George Wallace literally stood in a schoolhouse door to block integration. Affluent white families left suburbs to avoid integrated schools, a phenomenon termed white flight. There was tremendous backlash in Northern cities, including New York in the 1950s and ‘60s and Boston in the 1970s and ‘80s. “Busing” would become a codeword to indicate opposition to integration. Richard Nixon governed as a vigorously anti-busing president. In 1974, in Milliken v. Bradley, the Supreme Court ruled that segregated school districts were not unconstitutional so long as separation of students by race was not explicitly mandated. 3/12 Has school segregation gotten worse recently? It depends on how segregation is measured and whether the question is about racial or socioeconomic segregation. Studies have found that in recent decades, segregation based on family income has gotten worse, regardless of how it is measured. On the other hand, racial segregation has held relatively constant by one measure, while by a different measure, it’s gotten worse. Segregation certainly appears to have deepened when simply examining the likelihood that a student of color will attend school with a white student, or vice versa. But when accounting for changes in population, the results indicate that the increase in racial segregation is simply because public schools have fewer white students and more students of color. 4/12 What impact does integration have on students? A significant body of evidence shows that students of color and students living in poverty benefit from attending integrated schools. One study found that going to a desegregated school “significantly increased both educational and occupational attainments, college quality and adult earnings, reduced the probability of incarceration, and improved adult health status” among black students. Another study showed that attending more segregated schools led to lower test scores and graduation rates, as well as higher crime rates among students of color. Research on socioeconomic integration has found that low-income students attending a low-poverty school made large test score gains (though no benefits came from attending a school with middling poverty). Several other studies and reviews of research have produced similar results. The research is much more mixed regarding the academic impact of integration on white and more affluent students. Most studies have found no apparent effect, one way or the other, on measurable outcomes, such as test scores or high school dropout rates. However, one study found that for white students, test scores, graduation, and college enrollment rates decreased after they attended a school with more students of color. This research has focused on the impacts of integration on certain measurable outcomes — test scores, graduation rates, adult income — and many argue that the benefits of diverse schools go beyond this and include, for example, increased tolerance and social cohesion. Studies have found that interactions with more diverse individuals can reduce prejudice and improve leadership skills. An important caveat is that many, though not all, of these studies examine older integration programs, often from several decades ago. Newer research finds that segregation remains correlated with lower achievement and, in some cases, wider racial and socioeconomic achievement gaps. 5/12 Why does integration seem to improve student outcomes? One of the leading explanations is funding, especially in the case of older busing programs. Although not always the case, segregated schools are sometimes poorly resourced, while integrated schools may be better supported, perhaps because of a higher number of politically influential families in the school community — and research suggests that spending more money on schools leads to better outcomes for students. One study of desegregation efforts across the country showed spending on black students in integrated schools was much higher than on black students in segregated schools. “The results suggest that the mechanisms through which school desegregation led to beneficial socioeconomic outcomes in adulthood for blacks include improvement in access to school resources, which is reflected in reductions in class size and increases in per-pupil spending,” the study concludes. Research focused on Louisiana showed similar results, pointing out that the increase in funding was likely a key driver of gains in high school graduation rates rather than exposure to white students per se. Another study focusing on Nashville showed that concentrated poverty rates harm schools’ achievement levels but can be counteracted through increased resources. However, other research has found mixed support for this theory. Specifically, a study on the end of desegregation efforts in Charlotte-Mecklenburg showed that when the district allocated extra money to newly segregated schools, the negative impacts of segregation were partially — but not fully — offset. 6/12 How common are integration efforts currently? Not especially common. A number of school districts, particularly in the South, have retreated from race-based integration as court orders were rescinded. In other places, desegregation efforts have ended because of political forces. The Supreme Court made race-based integration more difficult with a 2007 decision striking down separate systems in Seattle and Louisville. Since then, there has been a rise in socioeconomic-based integration efforts. According The Century Foundation, a think tank that backs integration, more than twice as many school districts or charter schools (91) had some sort of system for advancing class-based integration in 2016 compared to 2007. Even with this increase, however, just 8 percent of public school students attended a school in such a district. 7/12 Have school choice programs, such as charter schools, helped integration efforts? Overall, probably not, although it’s hard to generalize because there are many different choice programs in many different contexts. But while some charter schools have emphasized integration, on balance, there is not much evidence that school choice overall has ameliorated segregation. In fact, the research debate regarding charters generally focuses on whether they have exacerbated segregation or had no impact on it. Some argue the former, pointing to studies in places including North Carolina, Pennsylvania, Minneapolis/St. Paul, Indianapolis, and Texas. But other research has found small or no impacts — and in at least one case, a positive impact — of charters on segregation. School voucher programs are much less common than charter schools and so have less potential to systematically affect integration. There is also limited research on the impact of vouchers. However, one study showed that Louisiana's voucher program led to more integration in the state’s public schools, though slightly greater segregation in its private schools. 8/12 Is racial segregation the result of public policy (de jure) or choices by individual families (de facto)? It’s often assumed that school (and housing) segregation is caused by a series of individual choices that resulted in de facto segregation. But that’s not really the case, since those individual choices are shaped by discriminatory policies and practices. This is just a sample of the discriminatory policies that cemented residential segregation. As a result of such policies, African-Americans, regardless of their own socioeconomic status, are much more likely to live in low-income neighborhoods. Black families also have been less able to accrue wealth through homeownership, reducing their ability to buy houses in affluent areas with more desirable schools. In sum, a variety of explicitly discriminatory policies perpetrated in recent history have led to patterns of segregation in housing and education that remain today. Although there has been some improvement in housing segregation in recent decades, much of the country remains deeply segregated by race. 9/12 Do parents and families want their children to attend integrated schools? It’s difficult to generalize. Certainly it’s clear that both historically and recently, white families have often fiercely fought integration. Many have protested, moved to the suburbs, or sent their kids to less diverse private or charter schools. Income-based school segregation has also expanded as wealthy parents have bought houses zoned for affluent schools. On the other hand, some families clearly want integrated schools. A study of the school lottery system in Washington, D.C., showed that many families want diversity. In middle schools especially, the research found that families, across races, preferred schools that weren’t segregated in one direction or the other. This suggests that there is at least some demand for integrated schools. 10/12 Is most school segregation within districts or between districts? Some areas have addressed this issue by consolidating districts or busing students between districts. 11/12 What are some arguments against pursuing school integration? Some say integration is politically controversial and therefore unlikely to succeed; that it can harm a community by eliminating the idea of a neighborhood public school; that it sends the message to children of color that they can learn only when in a class with white, more affluent students; that students will have to spend too much time on buses; that it cannot succeed absent residential integration; that high-performing charter schools with few white students show that integration is unnecessary; that it’s a distraction from more promising reforms, such as increasing school funding; and that the benefits of integrations are only modest. Skeptics might also point out that studies showing benefits of integration often evaluate older programs and thus may not apply to initiatives enacted today. White and affluent parents have also often opposed integrated schools, arguing that they will harm their children — though there’s not much evidence to support this. 12/12 Has the federal government pursued integration in recent years? To some extent, but not all that aggressively. For instance, the government has funded magnet schools designed to pull from diverse student populations in different communities, while prioritizing diversity in grants for charter and pre-schools. But former Secretary of Education Arne Duncan told The 74 that he would give himself “a pretty low grade” on school integration, a policy that was not included in the Obama administration's signature education initiative, Race to the Top, or in No Child Left Behind waivers. King has stated that he supports voluntary integration efforts, as opposed to mandated busing or school reassignment. Notably, he will have only a short tenure and limited power to make significant changes in this area. However, the Trump administration seems unlikely to back school integration. The president-elect has talked about the issue little, if at all, and his education advisers have been sharply critical of the Department of Education’s Office for Civil Rights.